Think of the bed of your dreams. What’s important: your mattress, surely, and also beautiful, sleek linen or cotton sheets with a warm fluffy duvet or comforter for these cold, winter nights? So what have you missed? 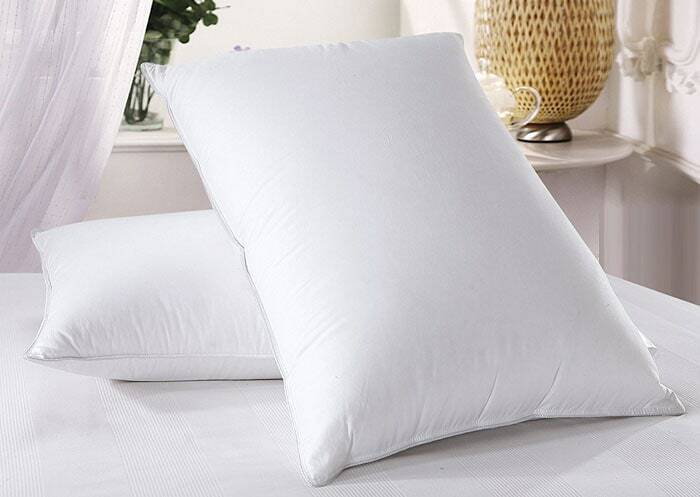 The most important of all – a fluffy down pillow to give you a fabulous restful sleep all night long. Your choice of pillow is extremely important. The wrong pillow can ruin your sleep and make you wake up with a sore neck. There are two main types of luxury down suitable for pillows fit for a king: goose and duck. Duck is the more common of the two, but goose is said to be of higher quality and the more expensive. Down pillows offer many benefits, but more on that later in our ‘Buyer’s Guide’ section. For now, here is our selection of the top 6 down pillows we have reviewed. We have chosen Queen Size as our example. * Queen Anne fill for Hard, Medium and Soft pillow Queen Size. King is 28/26/24 oz. Standard is 22/19/17 oz. Rating: All of those reviewed were excellent and these are the best six. It was difficult to give a 5/5 rating for any. #1 would have had a 5 were it not for the fact that we could not find any data on Fill Power or Fill Weight. #2 would have been top with a 5.0 had its warranty and return policy not been so apparently poor. The Queen Anne Duchess is a less expensive version of the Queen Anne range. That is because the filling is 75% goose down and 25% small goose feathers. Down always costs more than feathers because there is less of it available! This pillow will be better for those that need slightly more support than 100% down can provide. This is another of the Queen Anne pillows in the company’s Hotel Collection that is used by some of America’s top hotel chains, including Marriot, Hilton and New York Plaza. These firms will only use high-quality pillows on their hotel beds. The cover is 100% premium cotton ticking with a thread count of 330. It is filled with ethically sourced 75% goose down and 25% goose feathers. Handmade by an American family business. Good mix of goose down and feathers for those that need more support than 100% goose down can provide. None, other than no Fill Power and Fill Weight. A 30-day money-back guarantee enough? 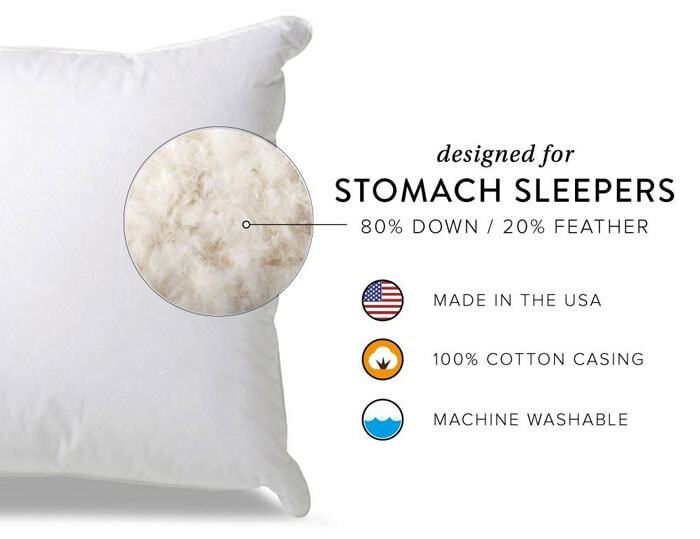 Editor’s Note: If someone is buying a pillow, they should be given some indication of how much filling they are getting and perhaps even what the Fill Power is (see Buyer’s Guide below). 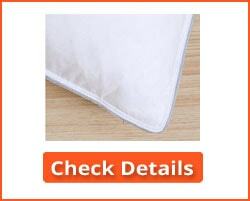 Although this is a high-quality pillow, the company should provide this type of information. Otherwise, this is a top class pillow from the Queen Anne company. It is suitable for all types of sleepers: back, front and side, and keeps your head comfortably supported. The WENERSI premium goose down pillows are available in Queen and King size only. However, each size offers a firm and soft version. Although described as goose down, the fill is actually 85% goose feathers and 15% goose down. The covering of the pillow is 100% cotton. Although feathers are generally associated with quills that can penetrate the covering, the company states that the feathers used in this pillow are ‘quill free’. Many of the external reviews we have researched confirm this, although a few do make comments about feathers escaping – though just a very small percentage of buyers. Another positive is that the pillows have been authenticated by ULTRA FRESH which means that they are free of any chemicals that can trigger allergic reactions. They come in packs of two pillows in both Queen and King sizes. All goose feathers and down: no coarser duck feathers. Ultra-Fresh antimicrobial treatment: Authenticated by ULTRA FRESH. Suitable for all types of sleeping positions: Back, side and front. Although it should be a positive attribute, the availability of a ‘Soft’ and ‘Hard’ version of each pillow size does raise the question of choice. What exactly does ‘Hard’ and ‘Soft’ mean? No information is provided as to the relative Fill Power or Fill Weight of each! No Warranty is published, but returns will be accepted within 15 days of delivery: 15% restocking charge. You get better if you buy from Amazon! Editor’s Note: We believe that if a product is faulty there should be a full refund with no ‘restocking charge’. A fault is due to the supplier, not the buyer, so why should they pay anything for it! This is a good product, which is why it is included in our top five. However, it may have been listed at #1 were it not for this policy. Don’t let that put you off buying it, because it gets 97% positive reviews from those who purchased it. It is made in China, as many down pillows are. 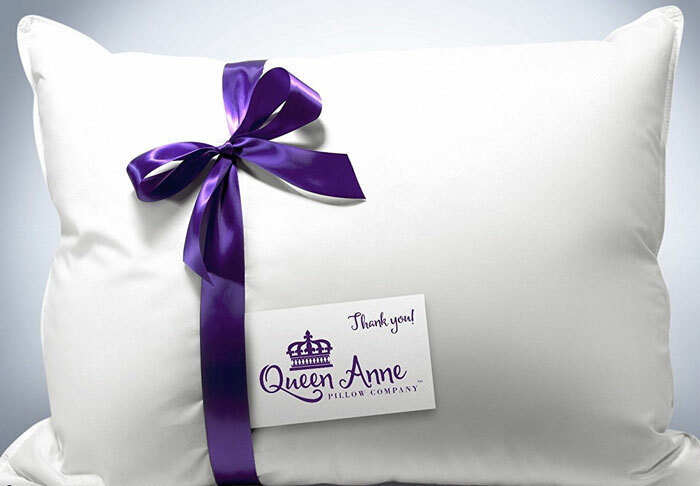 The Queen Anne pillow is stated to be used by Marriot Hotels, the New York Plaza and Hilton Hotels among others. That may explain its high price tag. However, our review is not based on who uses it or what the price is, but on what we believe it to be. 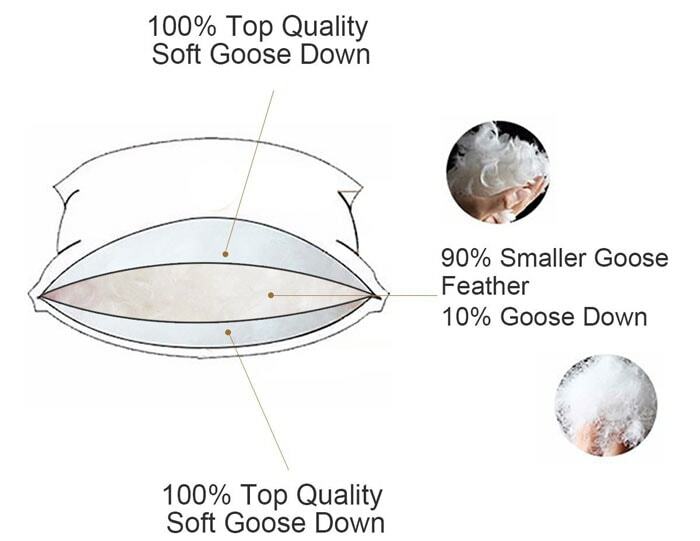 First, it contains no feathers, only goose down – which is an immediate indication of quality. It has also been hand-filled and not packed using a machine. This enables down packers to digitally calibrate the down clusters and make sure they are of good quality. There are no quills anywhere to scratch you: quills come only from feathers, not from the down (see our Buyer’s Guise below). It also made by an American family company. If you prefer an American product to an Asian one then this could be your choice. Another benefit is that you have a choice of soft, medium and hard for each of the main three popular sizes: Standard, Queen and King. Although out reviews are based on Queen size, the general comments relate to all sizes. 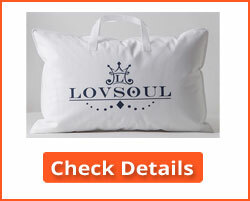 Three softness level for each of Standard, Queen and King size pillow sets. 330 thread count for each 100% cotton ticking cover. Piped edged distinctive to Queen Anne. Other than providing no Fill Power or Fill Weight, this pillow is worth the relatively high cost for a superb quality 100% down pillow. Editor’s Note: This pillow, handmade by the Queen Anne Pillow Company in the USA, is a high quality 100% goose down pillow. This means it has no quills – only feathers have quills, not down. It is available in Standard, Queen and King size. Each size is available in three levels of hardness (or softness.) 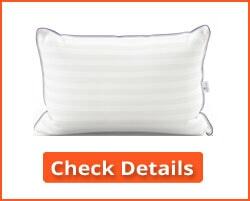 This pillow is the best of these we have checked out, although its review may have been better had it provided Fill Power and Fill Weight as other manufacturers do. 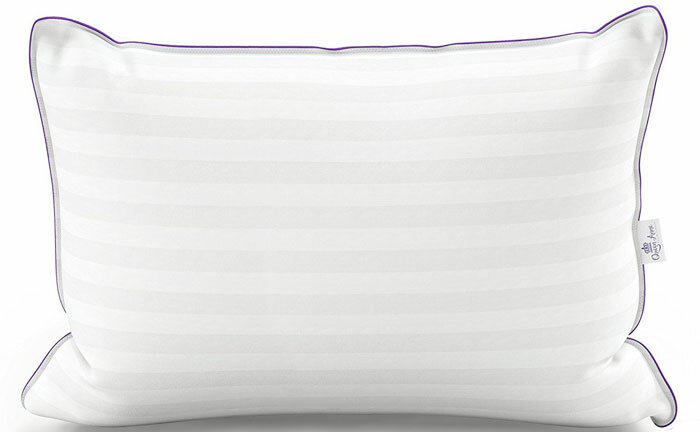 The Llovsoul goose down and feather pillow marketed by Llovsoul and manufactured in China by Enjoy Bedding, has a 100% Egyptian cotton stripe cover that not only looks fashionable but also keeps the down and feathers where they should be – inside the pillow. It is made using three chambers that prevents the filling from moving about too much while you sleep. The double needle stitching also helps to retain the feathers and down inside the pillow. The inner chamber is filled with 10% goose down and 90% goose feathers for support. The outer chambers are filled with 100% goose down for comfort. 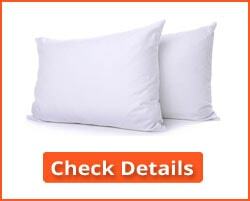 The recommended cleaning method is to have this pillow professionally dry cleaned. Available in packs of two. 100% goose down top and bottom, with goose feathers in the middle. Seems a good arrangement for comfort and stability. Egyptian cotton helps keep feather and down in, and dust and dust mites out. No specific warranty stated. Llovsoul website states that products are protected by Amazon’s A-to-z Guarantee Protection. No Fill Power or Fill Weight data provided. 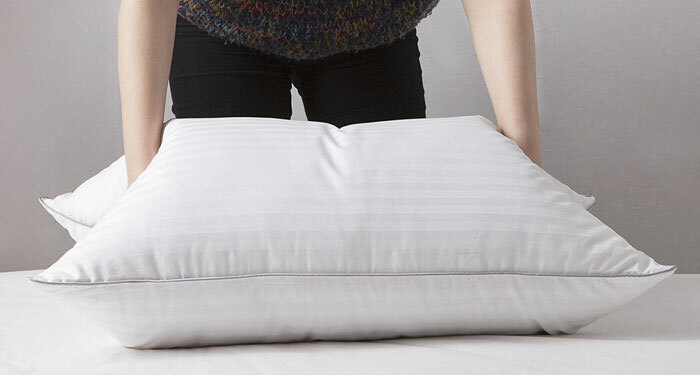 Some reviewers of this pillow claim it to flatten down after a time. This is a property of most feather and down pillows. They need to be shaken now and again to redistribute the filling evenly again. Not really a con, but it’s important to understand that loose fillings are different from contiguous foam fillings. Editor’s Note: This seems to be a well-designed pillow. It has a core of small feathers, which offer support, with goose feather compartments top and bottom for comfort. We have rated it lower. Not on its comfort and construction, but for the fast, it appears to rely on Amazon for support and other data are missing. That said, those that have had issues have found it easy to contact the supplier and have found their problems to be quickly resolved: with replacements or a refund. The Royal Hotel Bedding down pillow is filled with 100% down and fitted with 500 thread count cover. This provides a smooth silky feel to the pillow and also helps keep the down inside the pillow and not on your face. The down fill is 45 oz (King size is 60 oz fill). Made in China, this is a high-quality pillow and is available in a set of two. It is fairly firm, so your head should not sag down into the pillow. The 45 oz fill is good for this type of pillow. (See our Buyer’s Guide for an explanation of Fill Power and Fill). These pillows are dry clean only. 500 thread count cotton cover. Good fill power and fill. Claimed to be allergen free. Editor’s Note: This is a good pillow that offers excellent support for a down pillow. Some may find it too hard for them, but it can be fluffed up by heating it slightly to expand the air inside, then shaking it to distribute the air amongst the down. The 500 thread count cotton cover gives the pillow a good feel while keeping out bed bugs and dust mites. Like all pillows, however, this should be used with a good pillow protector for maximum protection. This Soft down pillow provided by eLuxurySupply, with a 525 Fill Power, has been specifically designed for front/stomach sleepers. A normal back sleeper would generally be most comfortable with at least 600 Fill Power. It is all contained within a 100% 230 thread count Cambric cotton casing woven tight enough to contain the feathers and prevent them poking through the casing. Nevertheless, you should use this pillow with a pillow cover or encasement. The filling consists of 80% white duck down and 20% feather, a blend which is particularly suitable for stomach sleepers. The filling has been treated to be as hypoallergenic as possible for a down and feather filling. The cover allows the pillow to breathe without permitting feathers to poke out. You can purchase a pair of these for a lot less than twice the price of a single pillow. Available singly or a pair: the pair is significantly lower cost for each than a single. 100% cotton 230 thread count – tight weave keeps feathers in. Filling designed specifically for stomach sleepers. Hypoallergenic – as much as it can be with a down and feather filling. Machine washable and machine dryable. The guarantee lasts only 30 days – return within free 30 days if not satisfied. No full warranty information provided: contact supplier for this. Editor’s Note: This seems an excellent down pillow, with a good 80% down against just 20% feathers. The only issue here is that both down and feathers are a duck. Nevertheless, this is a good combination for stomach sleepers. The lack of a full warranty is disappointing, although you may get details if you contact the manufacturer rather than the supplier. This may particularly be the case if you purchase from Amazon. Before purchasing a down or feather pillow, it is important to understand what you may be buying. Here is some information and advice to consider when you are thinking of buying a down pillow either online or from a mall store. Feathers and down come from different parts of the bird. The most popular birds are ducks and geese. Most feathers come from birds which have been killed for food: slaughterhouses sell the feathers to whoever wants to purchase them. That is frequently mattress, comforter/duvet and pillow manufacturers. Down: Down comes from the underbelly. It is extremely soft, and due to its structure with lots of small bundles of tiny, light feathers and air pockets that hold in the warmth, down retains heat. In fact, it is one of the world’s best insulators. However, should it get wet, it is very difficult to dry out. That is why a moisture-proof pillow cover is essential for down pillows. Feathers are much coarser in structure, but they also have their uses. Feathers: Feather pillows and provide better support for side and back sleepers than down does. Sure, they may release some feathers and quills, but that should only happen with lower quality feather pillows or pillows that are old. You can cut this annoying property to a minimum by using a decent quality pillow protector or pillow cover. Allergies: Feathers and down have a bad reputation for allergies. It may be true that some people are naturally allergic to feathers and animal hairs, although most allergic reactions from down and feathers are not sued to the material itself. It is often due to dust mites. More on this below. The greater the thread count, the softer the sheet will be. Higher Thread count textiles tend to feel softer to your skin, however, this does not mean they will last longer. Any thread count over 200 to 800 should be regarded as good – even if they take longer to be ratified. Dust Mites: These small mites are members of the spider family, and live on the skin cells that can permeate a badly maintained pillow and get in amongst the dust and feathers. That’s why poorly maintained pillows may eventually lead to allergies. 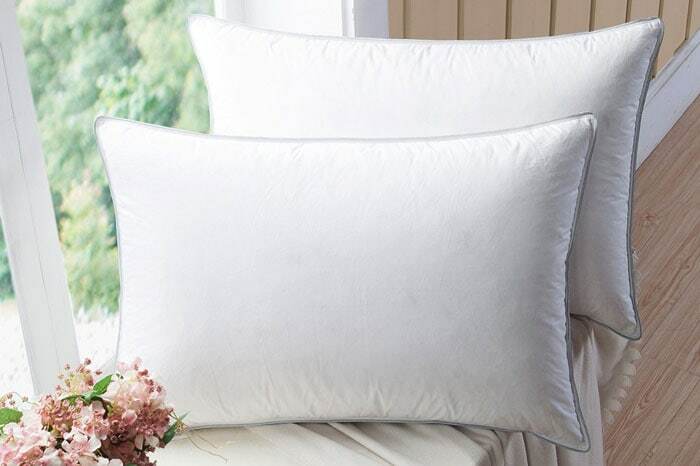 You can practically eliminate this by purchasing a pillow with a high thread count cotton or polyester cover, and then use a similar grade of pillow protector. This not only keeps down and feathers in, but also keeps skin cells and dust mites out. 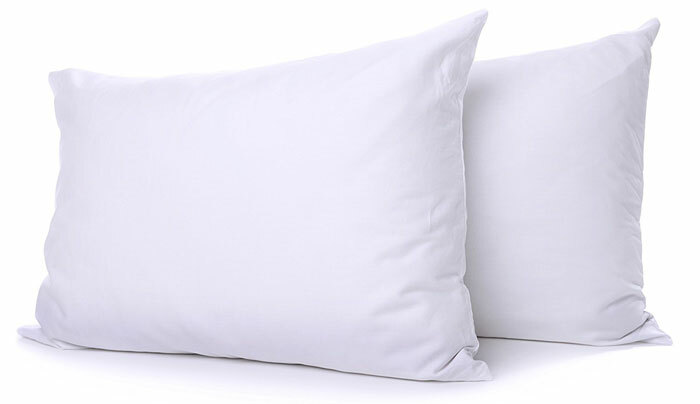 Pillow protectors, also known as pillow encasements, covers, slips or cases, should be washed regularly to remove surface dust (usually composed of skin cells). Here are some of the more common questions we have been asked about down pillows. 1. What’s the difference between feather and down and why use both? Feathers are feathers – you know what these are. However, the feathers use in pillows are very small ones, not the large thick-quill feathers used in flying. They are the small feathers that not only insulate the goose from the cold but also streamline it in flight. By using the smaller feathers, we reduce the size of their quills, and so help prevent them from poking through the pillow. However, due to their construction, they provide solidity to a pillow – if you want a hard pillow, then feather fillings help you achieve that. 2. What is meant by ‘Ethically Sourced? The term ‘ethically sourced’ means that the geese were not killed just for their feathers. Geese are commonly used for special meals, such as at Christmas or the Holidays. Many slaughterhouses will sell the feathers and down to the mattress, comforter/duvet and pillow manufacturers. Some goose farms will remove the down from the goose when it starting to fall off itself. Others collect goose down that are lying around in goose farms, and wash and sell it to bedding companies. 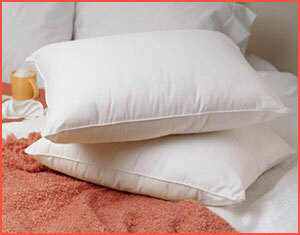 Down pillows can be washed in a normal washing machine in a gentle cycle at a lowish temperature: 30 degrees is good. Use a gentle soap solution (never powder) and run it through the cycle for your temperature for fragile or woolen goods. You can also machine dry it using three drying balls or tennis balls to keep the pillow fluffed. Use a low to warm heat setting and check after each cycle. If the down is still in clumps it will need another cycle. When dry, give it a good shake up to fluff it up again. 4. What firmness of pillow is best for me? A lot depends on what you are looking for and how you sleep. Generally, it is a matter of personal preference. Some people prefer hard pillows to softer varieties. The more feathers in your pillow, then the more support it gives you. If you sleep on your stomach, then you will likely find a soft 100% down pillow to be best. However, it has to have enough a support so your face doesn’t just disappear into it, so you may find that 75% down and 25% feathers will suit you better. 5. 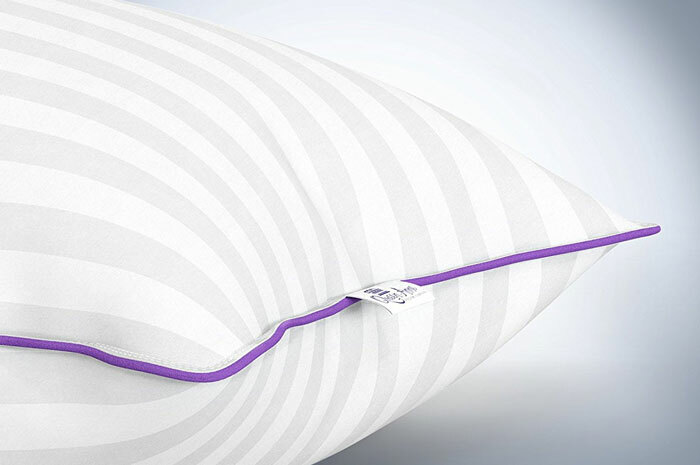 What does Fill Power and Fill Weight mean in terms of how the pillow feels to sleep on? Fill power refers to the size of the down clusters. Larger clusters have a higher fill power. This is also referred to as the ‘loft’ of the down. Fill weight is self-explanatory: it is the weight of down or feathers in the pillow. Fill weight should increase with increasing [pillow size, so a king size pillow will have more fill weight than a queen size. That is one reason why we always use the queen size pillow for our reviews. Fill weigh then has a genuine meaning. Unfortunately, not all suppliers provide these figures, which makes it difficult to properly compare down/feather pillows. Our best down pillows reviews were based upon available data, user experience, personal experience and a review of manufacturer and vendor websites. Your pillow is a very important component of your bed, yet many people tend not to give their pillow the attention they should. They may take great care when purchasing a mattress; yet use any pillow available along with it. Down pillows are particularly soft and comfortable, but unless they are packed hard with down, they may not give you sufficient support. That said, the down pillows we have included in our top six offers a range of comfort and support. Most contain a combination of down and feathers: feathers for support and down for comfort. Our best down pillows reviews provides you with a good selection to choose from.